Hello Friends! So as you probably know, The Lego Movie 2 just hit theaters! And let me tell you, it was awesome! (< Yes, pun was intended ;D) I've seen it twice so far and it's just soooooo good! Anyhoo so in honor of the new movie, and the fact that the weather isn't cooperating for a doll photo shoot I thought it was only fitting that today I posted some Lego photography! Please keep in mind that I'm absolutely terrible at photographing Minifigs, my camera only focuses on them if I use flash so it usually cases the background to become black. 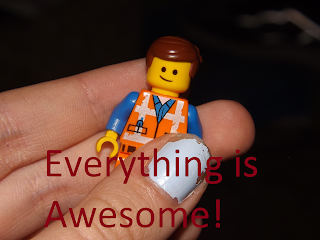 I will be featuring the Lego Movie 2 characters that we have and will do my best not to spoil anything. Enjoy! "Who am I? Hahahaha..... I'm your worst nightmare!" "Ok everybody, listen up! Everyone get along.... Ok I'm out! Going golfing!" This is literally just a background character, sooooo, she has no lines. I actually have a theory about her, if you'd like to hear it let me know! "You can stop whipping me, Deborah!" My brother got this the other day and he wanted me to include some pictures of him :) He's a really cute little Minifig isn't he? Thank you all SO much for reading! Do you like Lego? Have you seen the Lego Movie 2 yet? Would you like to see more Lego posts in the future? I would totally love to know! Wow! These are so fun! I think my favorite pictures are the ones of Batman. I also really love President Business's golf outfit! I find when photographing little things like Lego, it's best to use manual focus, stand quite a ways back, and zoom in. (Don't quote me though, I'm really bad at Lego photography. XD) I would love more posts like this, and I totally get what you said about the weather. Up here it's been -40 for almost three weeks! What' your weather like right now? Thank you SO much! I'm so glad you enjoyed! Thanks, Batman is my favorite character XD LOL Fun Fact about President Business, I had heard so many Lego fans feel though the blind bags to find the characters they want. So of course I thought, "Sure! I can do that!" Well..... Long story short I thought the golf club was a cat XD I told my friend about it afterwards and I don't think she's going to let me live that one down XD moral of the story, it might be a golf club, just a thought ;) oh ok! Thanks for the tips! I'll try those! Lol Lego is hard to photograph XD Awesome ok! Next time I'll probably be able to make props too (I'm making a Lego stop motion so a lot of my Lego supply has gone into that) Aw man yeah, that does not sound fun. It's been CRAZY windy. I live up on a mesa with short trees so it can get really windy here.